LET’S FACE IT: Many homes in Western Washington are short on sunlight. I’m not just talking about rain clouds; I’m talking about mature stands of Western red cedar and Douglas fir, towering above neighborhoods and plunging houses into twilight even on sunny afternoons. As a rule, tree cover is a great thing. After all, our region’s natural ecosystem is a dense coniferous forest that supports thousands of unique plant and animal species. However, if you’re a gardener focused on edible plantings, the urban canopy can present quite a challenge. The vast majority of edible plants, from annual vegetables to fruit trees and culinary herbs, demands full sun exposure. They also demand a space with a relatively neutral soil pH and very little competition from other species. Large conifer trees cast shade, acidify the soil and spread incredibly dense root systems across the landscape. As a result, the success of conifers and edibles is typically an inversely proportional relationship. Somebody wins, and somebody loses — that is, until you begin to consider the wonderful world of native plants. Our native plants are native, after all, because they’ve evolved to thrive in exactly the conditions provided by cedars and firs. Northwest native plants thrive in shade, prefer acidic soil, use less water than cultivated species, are more resilient to pest and disease pressure, and provide more suitable habitat for local fauna. And as luck (or Mother Nature) would have it, many native plants are also edible. Quite an elegant solution for the shady backyard! The list of native edible plants includes dozens of species, from ground covers to large shrubs and trees. Many of these species have a place in the home landscape, but the evergreen huckleberry (Vaccinium ovatum) deserves a spot at the center of any edible shade garden. This delightful species provides year-round interest and produces one of the most delicious wild fruits (like a blueberry, only … better). The evergreen huckleberry is a broad-leaved shrub that features shiny, waxy leaves and striking pink and white flowers. The leaf color can be quite dynamic, as new leaves have a reddish/gold color. The leaves mature to a dark green over time. Look for flowers to emerge in midspring, and for huge amounts of ripe berries to show up in the early fall. 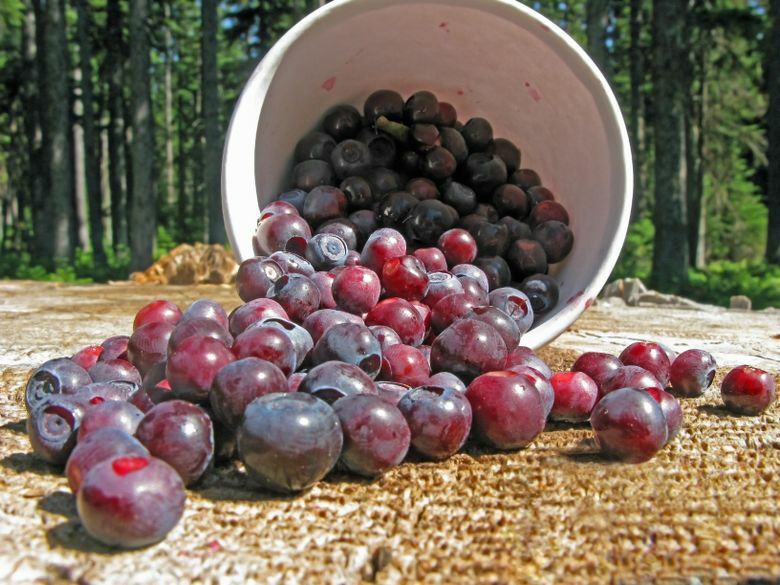 Huckleberries are widely available at local nurseries and are typically sold in 1-gallon pots. Due to their slow growth rate, it might be worth paying a premium for larger 2-, 3- or 5-gallon plants, if you can find them. When planted in a sunny spot, an evergreen huckleberry often will top out around 2 or 3 feet in height. However, in full shade (say, for example, in the shadow of a 50-foot Douglas fir), a shrub can grow up to 10 feet tall and 10 feet wide. Like all fruiting plants, huckleberries will perform best if you prune off their blossoms the first season you transplant them to your yard. Blooming and fruiting take a lot of energy, and freeing the plant of this burden allows it to focus on root and vegetative growth, leading to healthier plants and more robust future harvests. Huckleberries prefer a soil pH between 4.3 and 5.2, which shouldn’t be a problem if they’re planted under or near any of your coniferous trees. As with any new perennial, it’s best to irrigate for the first few seasons after planting, but once they’re established, your huckleberries should require virtually no maintenance. 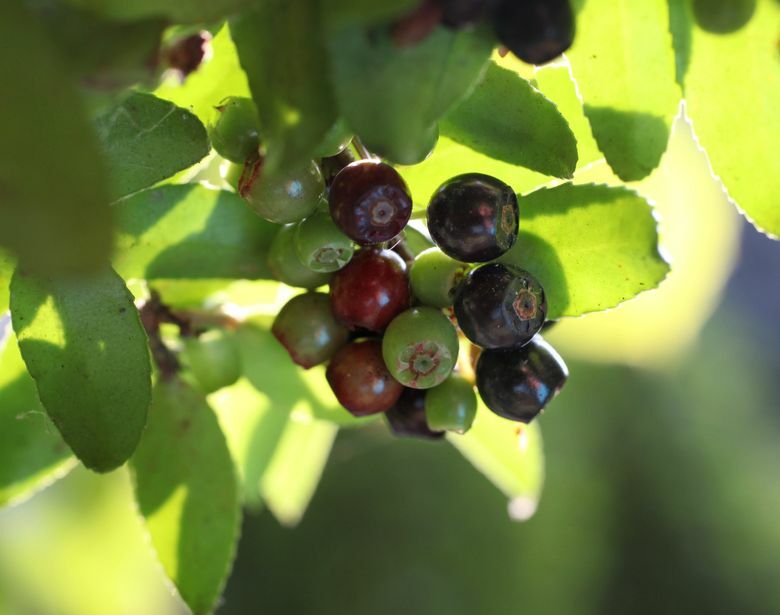 Even if you don’t have a spot for huckleberries in your yard, keep an eye out for them on your summer and fall hikes — they can easily be found along trailsides throughout the region. If you’ve never noticed these striking shrubs before, you’ll marvel at their beauty and comically heavy fruit set. And if you’re like me, you’ll also wonder why these native beauties aren’t already planted in everybody’s yard.